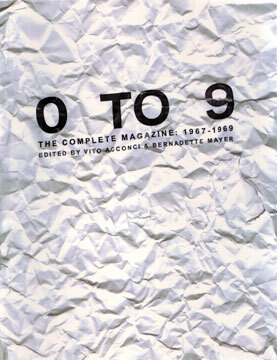 From 1967 to 1969, Vito Acconci & Bernadette Mayer collected the works of the some of the most exciting artists and writers for their mimeographed magazine, 0 TO 9. Robert Barry, Ted Berrigan, Clark Coolidge, John Giorno, Dan Graham, Michael Heizer, Kenneth Koch, Sol LeWitt, Jackson Mac Low, Harry Mathews, Adrian Piper, Bern Porter, Yvonne Rainer, Jerome Rothenberg, Aram Saroyan, Robert Smithson, Alan Sondheim, Hannah Weiner, and Emmett Williams, among others, were contributors. This edition published by Ugly Duckling Presse Lost Literarture Series.